When it comes to cool, casual style, nothing beats denim. The comfortable and durable fabric projects a stylish appearance without ever trying too hard, and we’re not just talking about jeans. Denim shirts provide the same aesthetic, offering a laidback yet luxe look that’s perfect for your weekend wardrobe. So, if you’re yet to add this classic shirt to your closet, now’s the time to do so. Denim shirts are more effortless to style than you might think and can work for any time of the year. Don’t believe us? We’ve rounded up proof that this timeless shirt looks fantastic in countless ways. For a classic take on the denim shirt, opt for a lightweight long sleeve style that can work during any season. 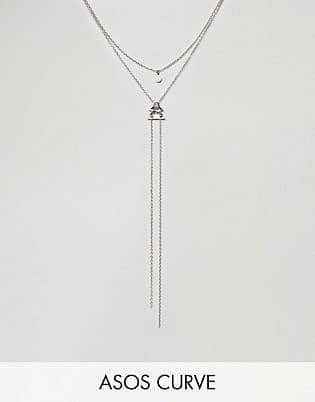 To get the most wear out of it, select a design that suits your style. 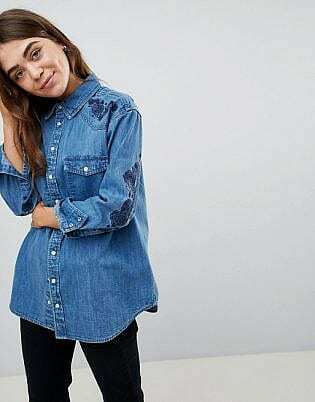 For instance, if you love a bohemian look, choose a denim shirt with embroidery. 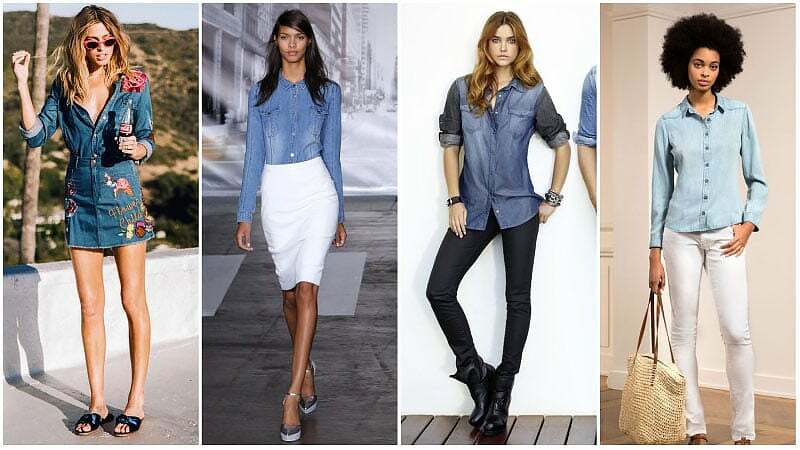 If you prefer a feminine appearance, pick a denim or chambray blouse. If you’re unsure what design to pick, try playing it safe with a mid-blue loosely fitted option. 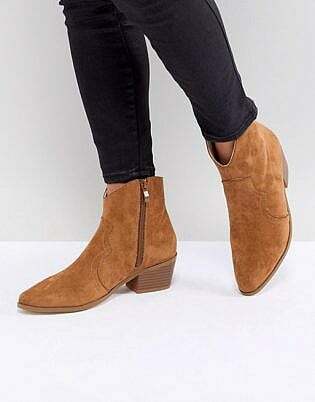 Then, just wear it with skinny jeans and heels for a smart style or boyfriend jeans and sneakers for a relaxed weekend look. While a long sleeve denim shirt is always a worthwhile wardrobe addition, short sleeve styles can also be fantastic to own. Like long options, short sleeve denim shirts can work with a variety of looks. All you need to do is select the right design for the aesthetic you’re aiming to achieve. In general, lightweight options in soft shades of blue tend to appear feminine and relaxed, making them a cute choice for summer and spring. 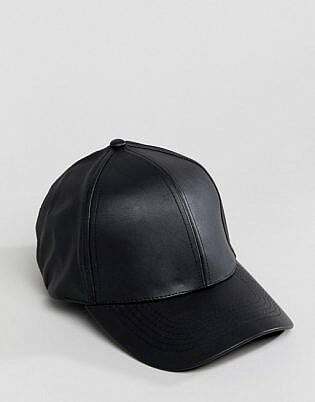 Darker and denser styles, on the other hand, often appear bolder and are best suited to attitude-heavy outfits. This season, silhouettes have been dialled up dramatically. 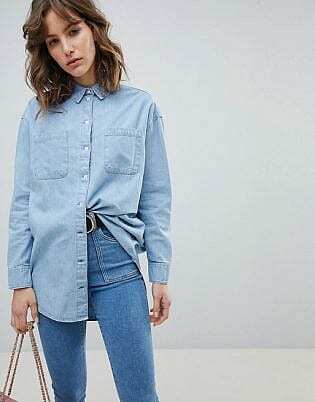 As such, if you’re after an on-trend take on the classic denim shirt, you can’t go past an oversized or extended version. Best of all, these boyfriend style shirts can work in more ways than one. 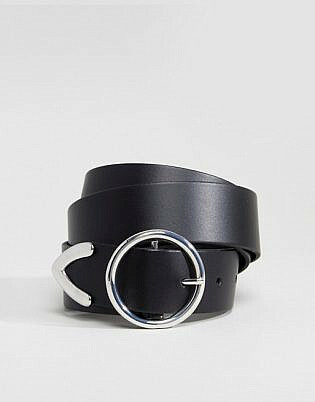 You can wear them as a standard shirt, loosely tucked into the waist of pants or jeans. Doing so will create a chic, relaxed appearance. Or, you can wear them as an overshirt or lightweight jacket on top of dresses and tops. While oversized denim shirts project a laidback look, fitted styles offer a more polished aesthetic. 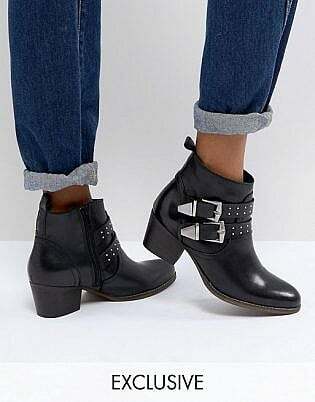 So, while their denim fabric makes them ideal for casual outfits, their sleek silhouettes allow them to also work for smart casual ensembles. 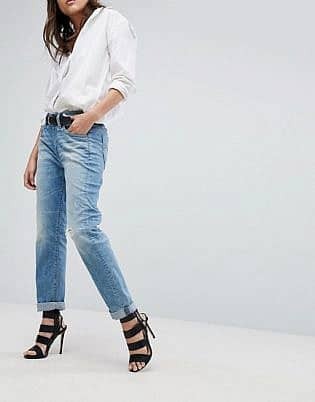 For a casual look, try partnering a fitted denim shirt with skinny jeans and boots or sandals. 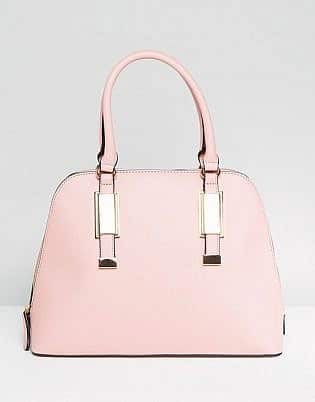 For something a little more elegant, swap the skinny jeans for a pencil skirt and add a pair of heels and leather tote bag. 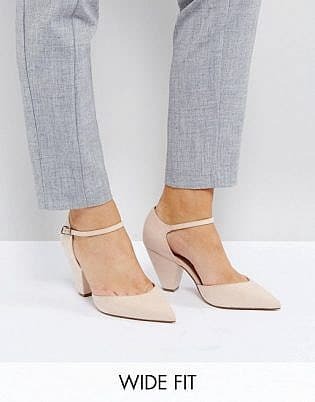 You can even wear this look to work if your office has a business casual dress code. 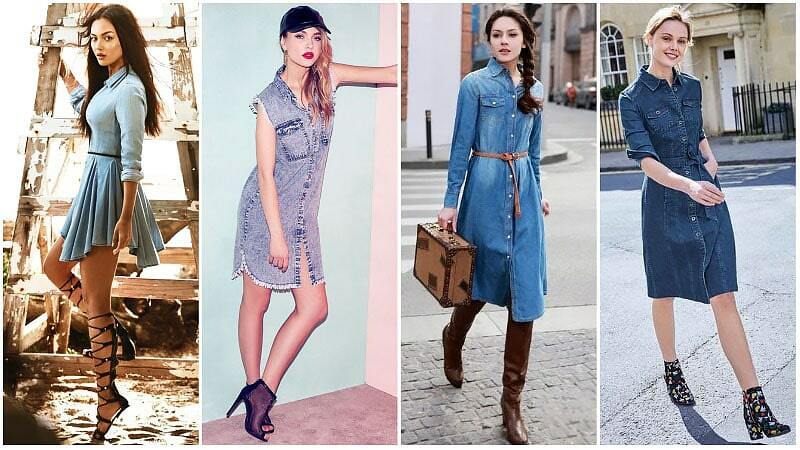 The classic denim shirt comes in many varieties, even a dress. 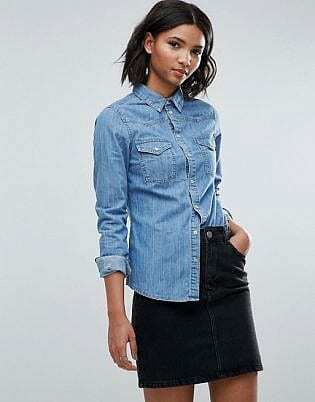 So, if you’re looking for a more feminine way to rock this style, be sure to consider picking up a denim shirt dress. 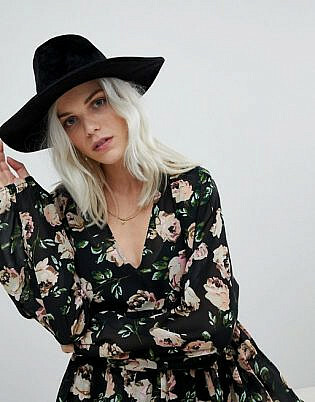 There are many styles available, including long sleeve, short sleeve, midi length, A-line and more. So, it’s easy to find the right one for you, but be sure to consider your silhouette in the process. 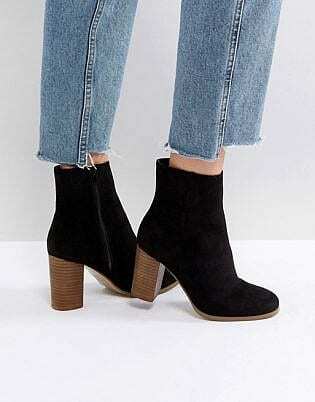 As denim is a thick material, denim dresses can often appear boxy. 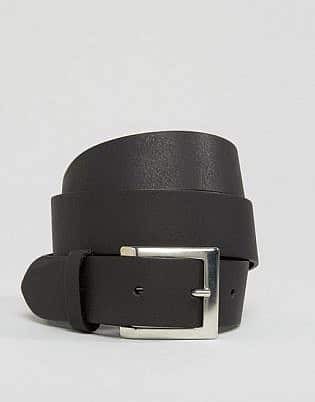 As such, selecting a fitted style or adding a belt at the waist is often ideal for a more flattering appearance. 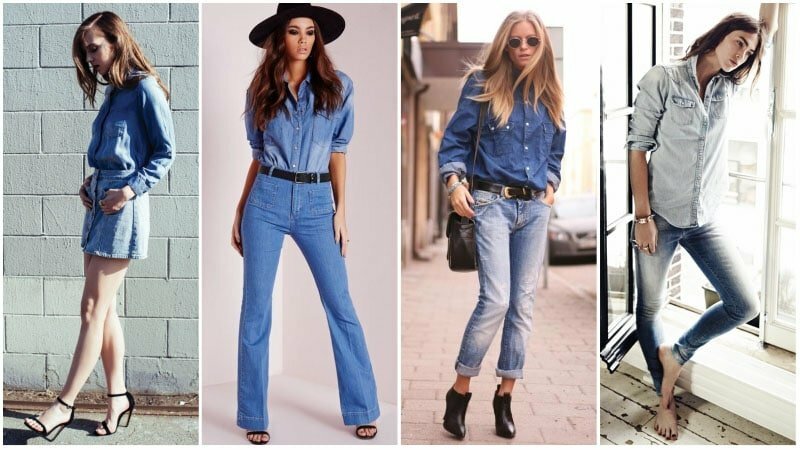 Are you still avoiding double denim like the plague? Well, it’s time to stop. 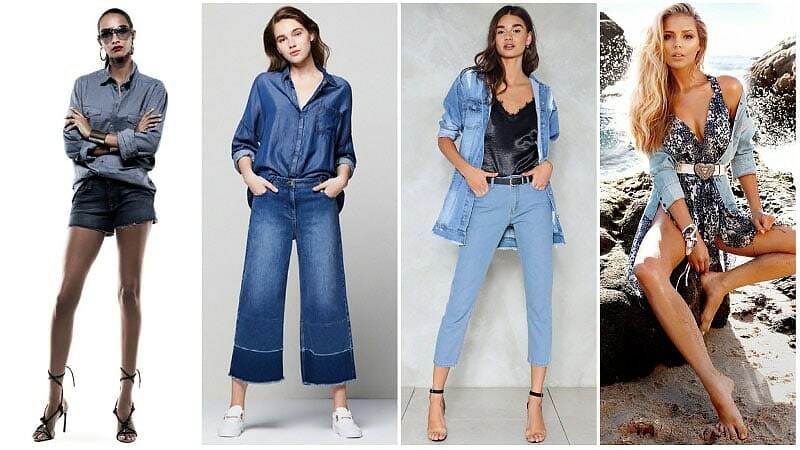 Double denim is officially on-trend once again and deserves a place in your wardrobe. Perfect for weekend events, double denim is comfortable, casual and cool. If you’re feeling bold, opt for matching shades of blue and break things up with black accessories. If you’re a little more apprehensive, however, try opting for one dark shade and one light hue. Doing so will create contrast and soften the look. 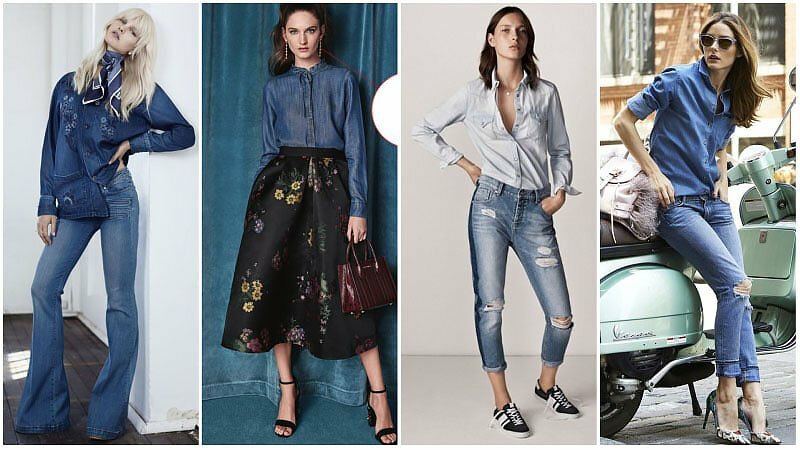 Denim shirts are more versatile than you might think. 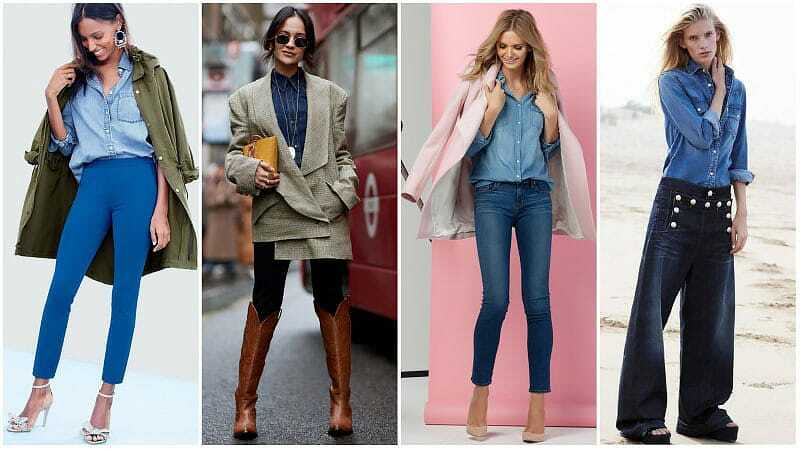 As well as being easy to throw on casually, denim shirts can also be used to create a variety of stylish, fashion-forward looks. 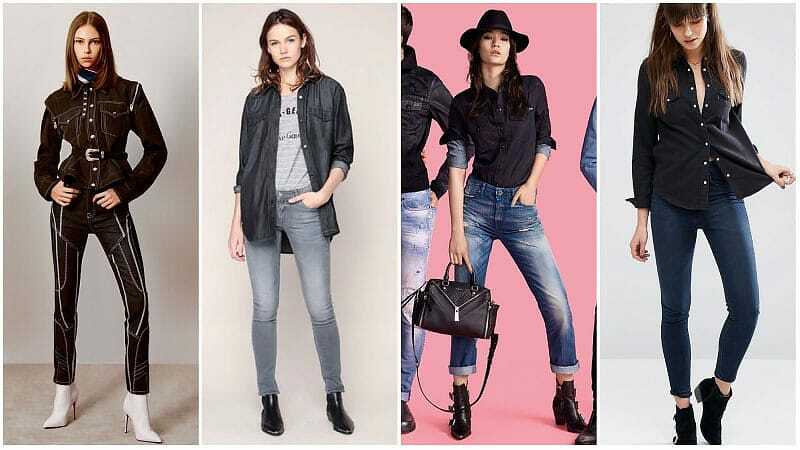 For one on-trend way to rock your denim shirt this season, consider opting for a western look. You don’t have to go head-to-toe cowgirl, but by adding a few western elements to your outfit, you can make it instantly more interesting and trendy. 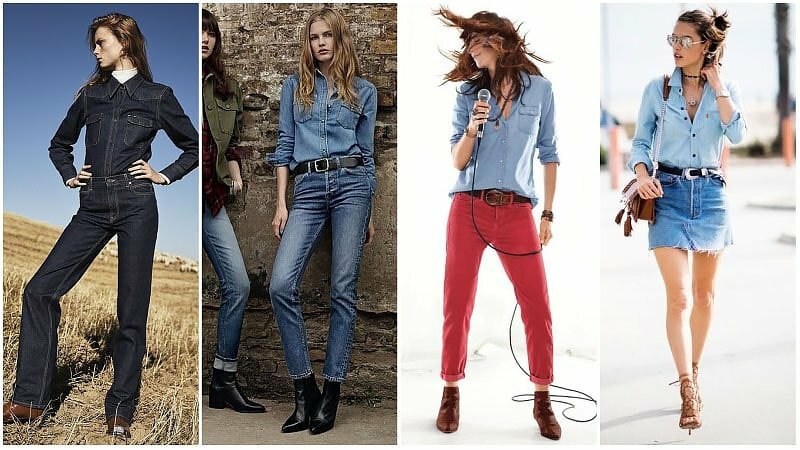 For instance, a double denim look with a large buckle belt and brown boots will immediately provide a chic country aesthetic. 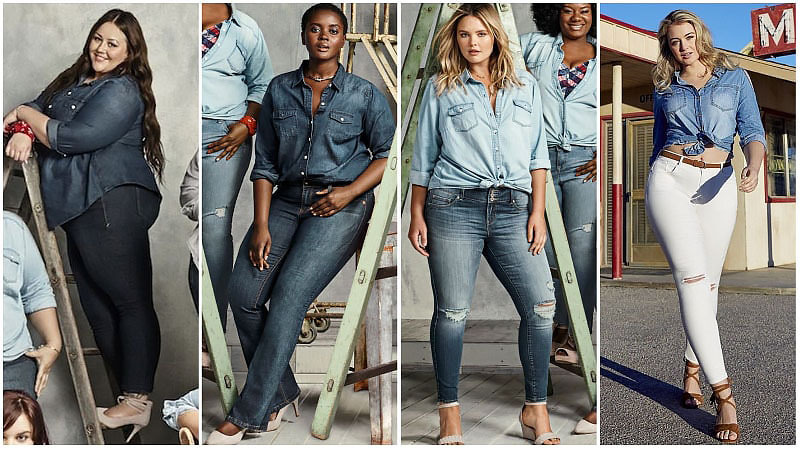 A denim shirt can look fantastic on all body types. 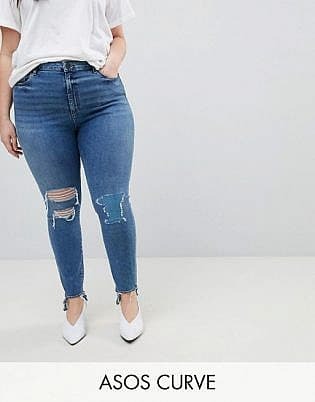 So, if you’re a curvy lady, be sure to embrace this trend. To rock the look, either opt for a fitted denim shirt and wear it loose or select a looser design and wear it tucked in or tied in a knot. 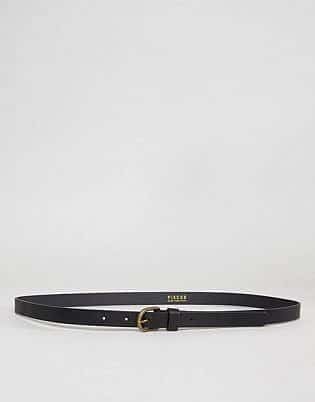 Doing so will highlight your waist for a flattering appearance. Then add slim or skinny jeans and a pair of heels to lengthen the appearance of your legs. 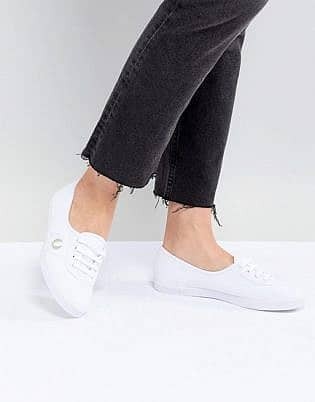 If you’re not a fan of the double denim appearance, you can always add more contrast with a pair of white or black jeans instead of blue. When it comes to the colour of your denim shirt, blue makes a stylish and timeless choice. Like black and white, blue denim is somewhat of a neutral fashion hue. As such, it can suit all skin tones and partners well with a variety of colours. If you have a light complexion and hair colour, try rocking a blue denim shirt with soft tones, such as light pink. If you have a dark skin tone and hair colour, however, consider pairing your denim with warm earthy hues instead. 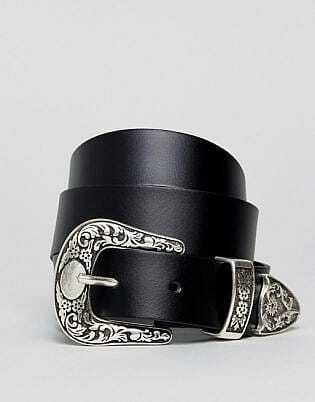 As well as a blue denim shirt, you should also consider adding a black style to your collection. 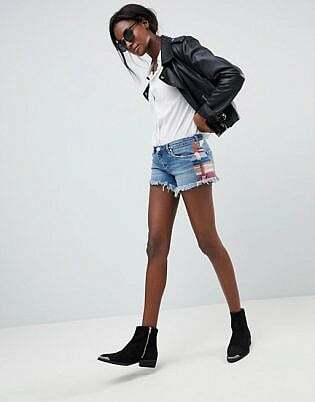 More unique than traditional blue options, black denim shirts are perfect for creating edgy outfits with a dose of attitude. Additionally, their dark hue also makes them ideal for winter. 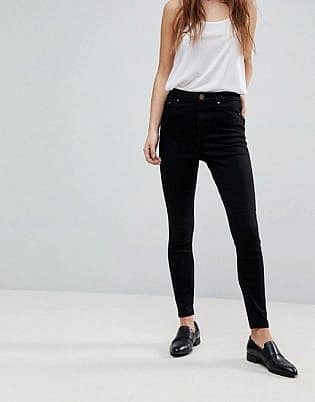 To rock a black denim shirt, you can easily add a pair of blue jeans. Thanks to the contrast in tone, this look appears more understated than a traditional double denim style. 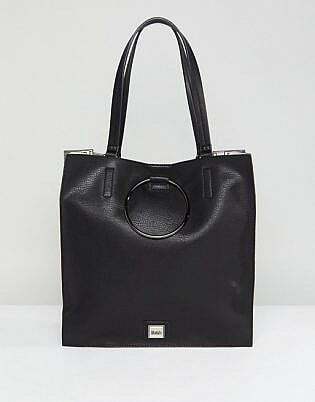 Then, add black accessories, such as boots, a bag, and a fedora to complete your ensemble.